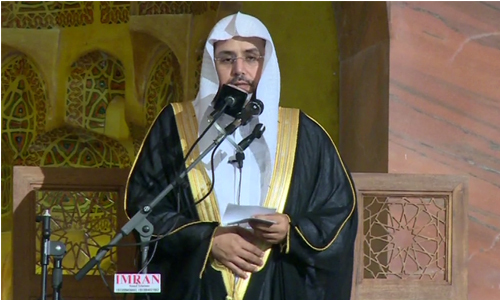 LAHORE (92 News) – Imam-e-Ka’aba Sheikh Khalid Al Ghamdi has said that Islam is the religion of peace and mercy. The Imam said that some people are defacing identity of Islam through violence. “There is no room for terrorism and violence in Islam. A true Muslim is never prejudiced. We should abstain from division by holding the rope of Allah. The Holy Quran mentions the victory of Truth and obliteration of Falsehood,” he said. He said that people belonging to all religions lead a peaceful life in an Islamic state. The Imam urged the people to get guidance from the Holy Quran and Sunnah in all affairs, including politics and economy.